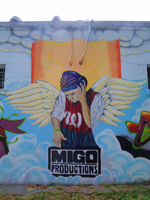 MIGO Productions began as Walter increased his DJ skills inspired by his cousin Geovany. One summer vacation trip to Puerto Rico changed Walter's musical focus to Reggaeton. Walter introduced Reggaeton as a mainstream music genre in Latin/International & Hip hop clubs and events in the area. Walter had amazing charisma and audiences loved him and connected to him through his music. To expand the Reggaeton explosion to new audiences and publicize MIGO and his talent, Walter created two great Reggaeton mixes which he distributed among his supporters, Various Reggaeton and Reggaeton Mix Tape Vol. 3. The response he received from these mixtapes was amazing. During this same time, Walter began appearing and producing on local artists' tracks. Many of these artists and groups worked closely with Walter to produce and market their music and his talent. Walter was always looking for new music and different sounds to inspire his mixes and techniques. Walter became even more motivated to continue pursuing his ultimate dreams. Unfortunately, Walter passed away in a car accident on Christmas Eve morning, December 24, 2003. Since, Walter's family & friends have worked close together to keep his dreams alive through MIGO Productions. 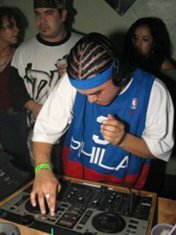 Two of MIGO DJs learned their skills directly from Walter, DJ Los El Genio and DJ Uncensored, and countless others have been inspired by him. In honor of Walter, the MIGO family has given focus to the community in forms of community and youth-based events showcasing local talent and providing family-friendly entertainment. Some of the events are hosted in front of the DJ Menace memorial on 14th Street & Quincy Street in NW. 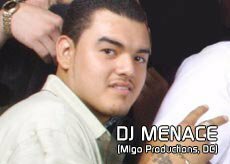 Follow DJ Menace on Facebook!